What are the steps of rest-pause training? Complete one maximum weight repetition. Take 15 seconds of rest. Complete another maximum poundage rep. Continue until you have completed 6 to 8 repetitions. Rest-pause training allows you to place an extremely heavy workload upon the muscle group repeatedly. This stimulates the fast-twitch muscle fibers, utilized in very heavy repetitions, as well as the slow-twitch fibers, which are called into play once you pass repetition 4 or 5. This method draws a great deal of blood into the region, and increases strength as well. It is very popular with powerlifters as well as bodybuilders looking to improve their strength levels. What should my warm-up be like? You should complete several light weight sets of 8 to 12 repetitions, followed by two sets at 70 to 80% of maximum poundage. Avoid excessive stretching, but complete enough so that your muscles are ready for a series of maximum lifts. What is my target repetition range? Six to eight repetitions is plenty. You’ll likely be extremely tired after this set and need 4 to 5 minutes of rest before tackling another movement. If you are able to complete 8 to 10 repetitions, it’s time to re-test your 1RM, because it seems you might not be moving enough weight each set. Training partners are advisable for rest-pause training for several reasons. First, they are good choices to objectively count the 15 seconds between repetitions. If you’re breathing heavy and your muscles are hurting, there is a fair chance you just might be tempted to count to 15 a tad slower. Additionally, you should always use a training partner when going for a single max repetition lift. Doing it for six or eight repetitions is essential. There are some exceptions, however. Deadlifts are one movement in which you do not benefit much from the presence of a spotter. Compound and isolation movements both work well with rest-pause training. For legs, squats can be a tad dangerous, but leg press is very safe. 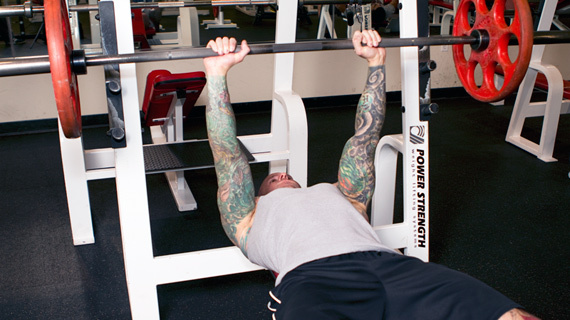 For chest, bench press (with a spotter) is the perfect movement, either flat or incline. If you’re training back, deadlifts and rows are great movements. Be cautious on shoulders – the risk of damaging the rotator cuff might outweigh any benefit you may see from rest-pause training. Biceps can be trained with barbell curls. Triceps are a bit trickier, but can benefit from simple cable pressdowns. Use your imagination and if something starts to hurt, avoid the movement. Within six weeks, you should see your single maximum repetition (1RM) go up by at least 10%, with 20% being a realistic expectation if this is your first experience using rest-pause training. You’ll need to increase your food intake by about 500 calories per day to facilitate new muscular growth. You also might notice you suddenly require more rest days, or sleep each night, to recover from these brutal workouts. Train hard, and smart, and see if rest-pause training allows you to make some gains in strength. This entry was posted in Training and tagged Bodybuilding, Bodybuilding Rest, Pause Training, Resp In Workouts, Rest In Training, Rest-pause Training, Training Reps Frequency, Workout Sets. Bookmark the permalink.